Beautifully restored 1981 FJ40 sold at Bonhams Amelia Island 2016 is ready to make new memories. The vehicle keeps all of the standard features of the original vehicle such as power steering, 4-speed manual transmission, and front disk brakes, but driving comfort is enhanced with upgrades such as Vintage Air A/C and 33" tires on a new Old Man Emu suspension. If you look at the "before restoration" pictures for this Land Cruiser, you'll see a car that may look ready for delivery. However, even though it was in extremely good condition, the vehicle was put through The FJ Company's extensive restoration process. As the pictures show, the FJ Land Cruiser was stripped down completely, the chassis was powder coated, and the entire vehicle was rebuilt from scratch using OEM Toyota parts wherever possible while maintaining the cars factory specs. The matching numbers engine was rebuilt, the transmission was rebuilt, the front disk/rear drum brakes were rebuilt, most of the electrical components were replaced, and the entire interior was re-upholstered to like new condition. A brand new custom soft-top was installed with very unique ambulance doors in the rear. Repainted in the factory original Freeborn Red - one of our favorite colors - the end result is a classic looking FJ40 upgraded with modern niceties for a very enjoyable ride. This is the ideal vehicle for someone who is looking for a reliable weekend-driver in any weather condition. Like it? 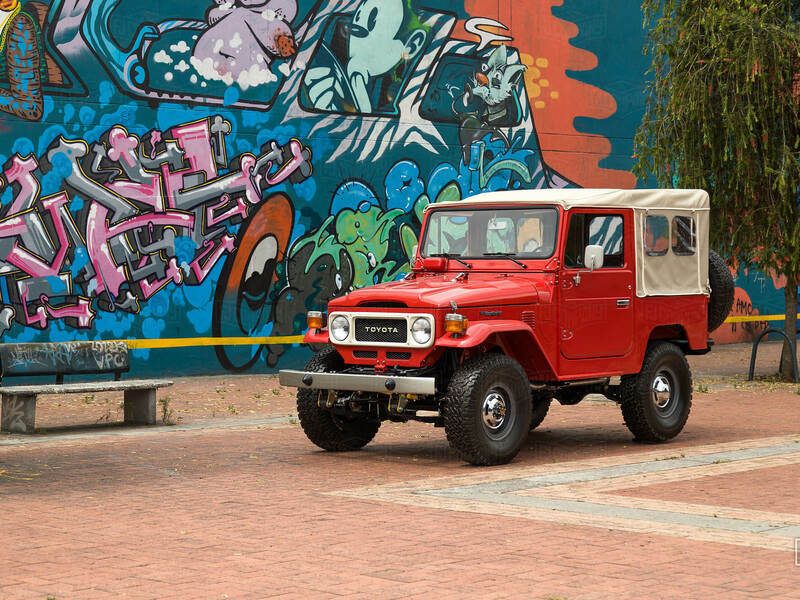 Build your own Classic Series FJ40.